My name is Andrew Weber and I recently served as a Zidisha Client Relationship Manager in Kenya. 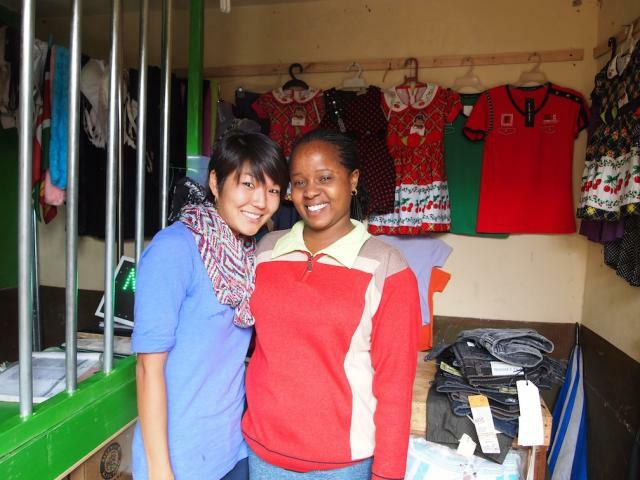 There I paid a visit to James at his business in a town on the outskirts of Nairobi. For years James watched as a friend consistently maintained a healthy profit operating a clothing store. James was already doing ok with his existing businesses selling charcoal and operating a motorbike taxi, but he wanted a little something extra to help support his wife and 3 children aged 12, 8 and 5. So he has decided to follow the proven copycat path to business success and has opened his own clothing store now. James used his Zidisha loan to enable this new business to get off the ground. He now has store fully stocked with clothing for men, women, and children. He has only been open for about a month but the early returns are strong. He is on pace to make about $140 on each large been of clothes he sells. If the business continues to do well he hopes to move his family into a large home. James’ plan to emulate his friend’s success appears to be perfectly on course right now. Financial inclusion continues to be one of the key challenges in the microfinance sector today that would play an integral role in shaping its performance in the future. At the Mexico G20 summit last summer, 17 countries led by the Presidents of Chile, Indonesia, and Mexico publicly committed to advance financial inclusion. Although the term microfinance has been associated with the working methodologies of Muhammad Yunus of Grameen Bank and with organizations such as Opportunity International, Accion and ASA, its employment as a tool to fight against poverty has always been debated, since its usage still lacks a necessary component to creating successful entrepreneurship values. The concentration of MFIs have been growing in the regions of Africa, Latin America and Asia over the years, and this trend is attributable to the increasing below-poverty line population in those regions alongside the proliferation of the urban poor. Primary sources of funds for early MFIs were generated from savings of clientele and venture capitalist funding. However, the scenario has been changing rapidly. Nowadays, Central Banks across the globe have been taking initiatives to allocate financial services to the poorest of the poor; this in turn, has enabled hundreds of MFIs around the globe to become profitable in the long run. Commercial banks have begun to acknowledge the profits they can achieve from the low end of the retail market and mobile phone operators continue to discover innovative methods of allowing the poor to access mobile-based banking services. 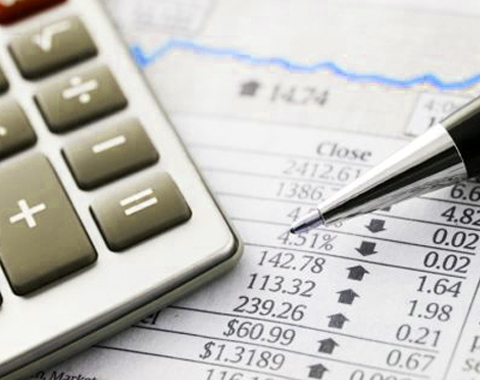 • Specialized Microfinance Institutions: Microfinance institutions are focusing on customer specific demands, which vary across a wide range of customers and according to the location. Last year saw an increasing progress in translating the needs of the poor into improved context-specific product offerings and policy approaches. A set of providers across the globe accelerated experimentation with innovative products that better match people’s savings needs and behaviors. For example, Jipange KuSave in Kenya tested the provision of interest-free loans with a third of the amount held back as savings. Opportunity Bank in Malawi has a commitment savings product for farmers that allow them to lock away their post-harvest payouts and distribute it over the year to smooth cash flows. • Diversification of Microfinance Institutions: Microfinance institutions believe in offering broad range of products and services under an umbrella of microfinance that previously started with small loans, now offers money transfer, insurance and savings services as well. • New channels: Branchless banking and franchisee-based services have become extremely effective and prevalent these days to approach potential clients who live in rural areas. One of the top developments in Kenya’s branchless banking industry was the launching of M-Shwari in Kenya, which provided access to savings and loans to M-Pesa customers. Through a partnership between Vodafone, Safaricom and the Commercial Bank of Africa, M-Pesa customers can now apply to CBA for a mini-loan and sign up for an interest bearing savings account, directly from their phones. Since its launch in November, M-Shwari now has 1million users. • Turnkey Solutions: Most of the microfinance institutions have started offering services to their clients that differ from traditional services like savings, insurance and loans. 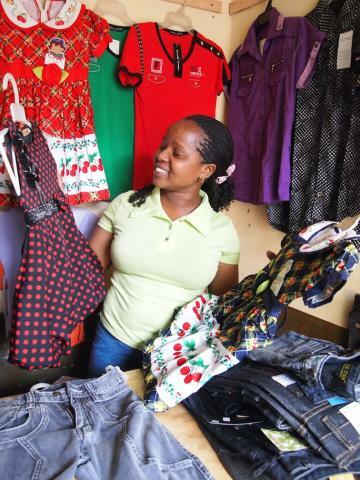 Some MFIs offer services such as supply chain management or assisting with marketing infrastructure to grow micro-businesses. The town of Salgaa, located 30 kilometers west of Nakuru, would not be described as a technological hub. In fact, many of the homes here do not have access to electricity. Considering this, it is not hard to imagine that many residents of Salgaa are not overly familiar with the use of computers. Boaz aims to change this. Boaz opened his current store in July of this year but has been teaching computer literacy classes since 2010. He was previously conducting classes in his home. However, the genesis of Boaz’s passion and appreciation for computers dates back to 2008. Boaz was in the town center of Nakuru four years ago where he saw a young Kenyan student being instructed on how to use a computer by an older Indian gentleman. Boaz remembers thinking, “If this young boy can use a computer, why can’t I?” He promptly enrolled in a two month computer training course. Currently, Boaz has 20 students who attend his daily 2 hour classes. The students are taught to use Microsoft Office and various other computer programs. Upon completion of the course, each student receives a certificate verifying that they have a competent computer literacy. This certificate is now mandatory for many government jobs. Boaz says the course he offers would cost students 5,000 Kenyan Schillings in an urban center like Nakuru or Nairobi, but he is offering his course at 2,500 Kenyan Schillings to entice the technology wary citizens of Salgaa. With his first Zidisha loan, Boaz plans to buy a printer, scanner, and photocopier. In the longer term, he plans on expanding his current business which currently includes six computers. He envisions starting Salgaa’s first cyber café. He also wants to start working with some of the local schools to incorporate computer science into their curriculum. Boaz is passionate about helping members of his community enhance their level of computer literacy as he believes it is of the utmost importance when trying to secure a job in today’s economy. 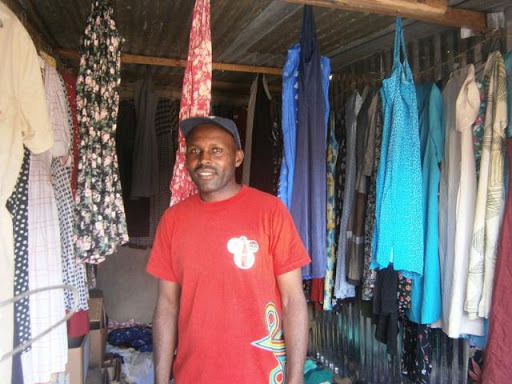 With the help of his loan from Zidisha, Boaz is spearheading the movement to educate his community.